The application of make-up is a skill that women are expected to possess, and yet one in which they very rarely receive any formal training. We are often reliant on a process of learning through trial and error; often an expensive path in a world where products are marketed on the basis of brand; not their suitability to different skin tones or bone structures. The secret of a beautiful face isn’t an expensively assembled make-up bag, or complicated application techniques; it’s about using the right products in the right places to bring your natural beauty to the fore. Debbie Delgado’s make-up lessons are designed to help strip away the mystery of make-up, and help to find the small number of products and the simple application techniques that are right for you as an individual. 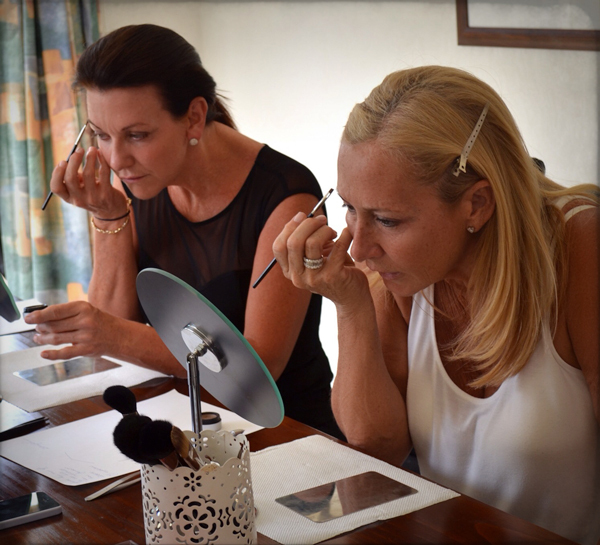 Each make-up lesson is unique as it is tailored to the experience and aspirations of the individual client… from teens looking to discover the secrets behind the latest looks to women aged fifty plus wanting to feel great. → Understanding what you as an individual want from the make-up lesson, by listening to your personal experiences with make-up. → Giving your make-up bag the feng shui treatment to remove the clutter of unwanted products, and leave it organised to make the most of the investment you’ve already made. → Step by step tuition telling you exactly what you need to know, what works and what doesn’t. → Creation of a “5 Minute Makeover” routine for you that will leave you looking great without taking over your mornings. If you have previous experience with makeup, Debbie can teach more advanced techniques and glamour makeup. → Tuition via a “half face” technique allowing you to build confidence by practicing new techniques throughout the make-up lesson. → Above all, the make-up lesson is designed to give you skills that will suit your lifestyle, and that are practical enough to have a positive impact on your everyday life. The cost of the make-up lesson is $250 per hour. The usual duration of the lesson is 2 hours. All lessons are conducted on a 1:1 basis, though Debbie is always happy to work with groups (large or small!). Contact Debbie today for more information on her private make up lessons.